I’ve been having so much fun creating recipes for the air fryer! 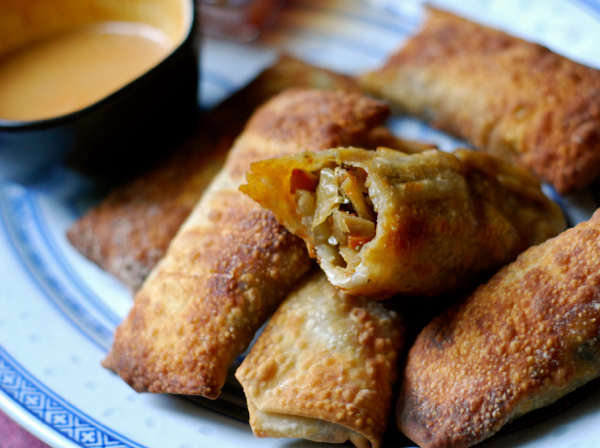 We made egg rolls for Super Bowl Sunday, and oh my gosh… They turned out soooooo good! Jeff and Grace added chicken to theirs, and if you do the same, of course you’ll have more filling than when you just make veggie egg rolls, so plan accordingly. When you make them without the meat, you’ll end up with approximately 28 rolls. Note: Be sure to dice the veggies, not shred them. It makes a huge difference in flavor and texture. When you shred the veggies your egg roll filling will become stringy. Also, when you use an air fryer, the idea is to use as little oil as possible. Feel free to use veggie stock to saute your vegetables, and rub the egg rolls with just a light coating of the canola oil. I added one Tablespoon of sesame oil to the entire batch of filling because it adds so much amazing flavor. You can cut that down to a teaspoon, or omit it altogether, if you wish. Heat olive oil (or a few Tablespoons of vegetable stock) in a large skillet. Once hot, add the carrots, cabbage, onions, mushrooms, water chestnuts, bamboo shoots, and ginger. Saute until lightly browned and the filling has lost most of it’s moisture. You can saute in batches if you want to, or use two skillets at once so the veggies don’t get too crowded. Add garlic during last 30 seconds of saute time, and then remove filling from burner. Transfer filling to a large mixing bowl and add: soy sauce, onion powder, garlic powder, garam masala, salt and peppers, and the sesame oil. Stir well. 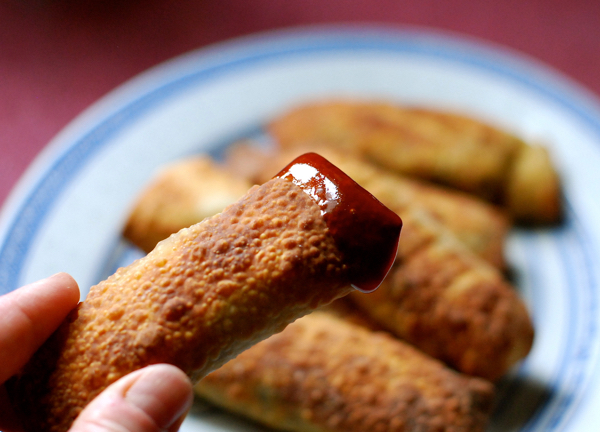 Get a little cup of water for dipping your fingers into as you seal the egg rolls. Lay one wrapper in front of you, with one of the square points pointed at you. Place approximately 2 to 3 Tablespoons of filling in the center. Wet the edges of the egg roll wrapper. Fold bottom corner up and over the filling, fold in each side, roll up and seal edge to finished roll so the filling stays in. The main idea is to seal all the filling in so it doesn’t fall out during the frying process. Repeat this process until all of your filling is used. Rub each roll with a little canola oil. Fry according to the instructions for your air fryer. 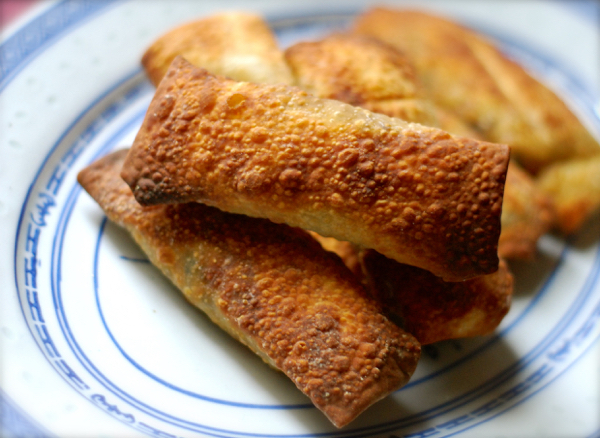 My Ninja cooked the egg rolls (12 to a batch, in two layers) in 10 minutes at 390 degrees F. I flipped them after the first 5 minutes of cooking. You want your rolls to be golden brown and crunchy on the outside, and hot all the way through. Serve with your favorite dipping sauces, such as: sweet and sour, teriyaki, hot mustard, and spicy peanut!